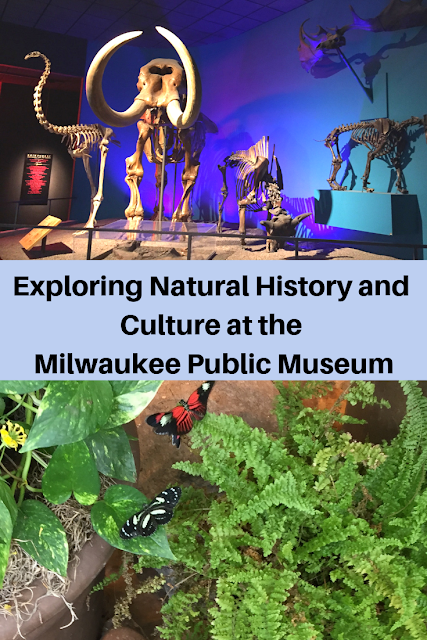 Milwaukee Public Museum fascinates visitors with quite a cache of natural history exhibits, a theater and a planetarium. Our first visit to the museum was punctuated with with incredible discovery after incredible discovery. Before we knew it, we had spent 3 hours at the museum and there were still more exhibits to see. So, a visit is quite a thorough experience that easily invites future explorations! Bones and fossils on display in an antique curio in the center of the museum. 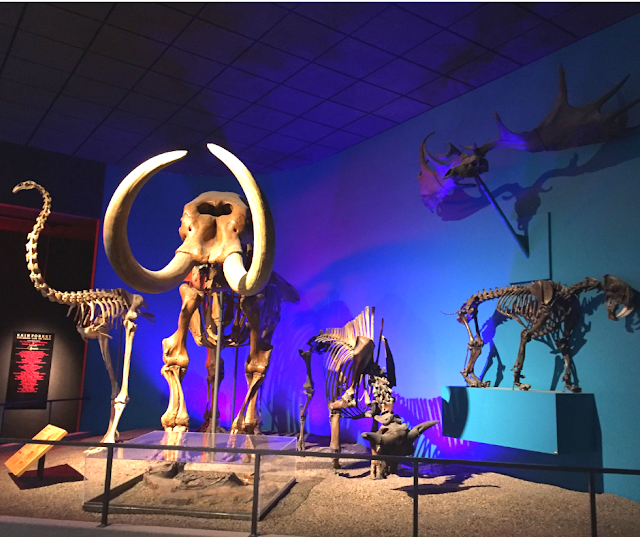 The Milwaukee Public Museum provides a home for over 4 million specimens. Every visit, you will certainly discover something new. We paused for a bit to admire just a few of the specimens in antique curios before moving towards the European Village. Taking a peek at European village life. The European Village engaged us for quite some time. While exploring, we learned about village life and the importance of community. Villages provided an important point of contact for people as well as a place of commerce. Village life would also include arms competitions, harvest festivals, Saint days and more. Construction materials were sourced locally. Wandering the village, you can peek inside village homes representing 33 cultures and will note some differences in materials as well as crafting traditions and more. Towards the mid 1800's, Europeans started leaving villages for a variety of reasons including more mobility, famine, pestilence, wars, better paying jobs in cities and more. Many would come to America. We enjoyed looking in through a window into each home. 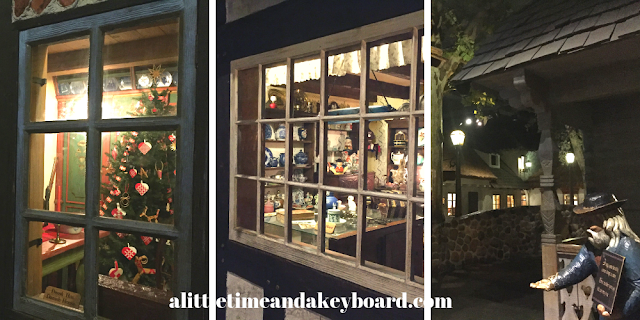 After wandering through the European Village, we took a stroll through the Streets of Old Milwaukee. 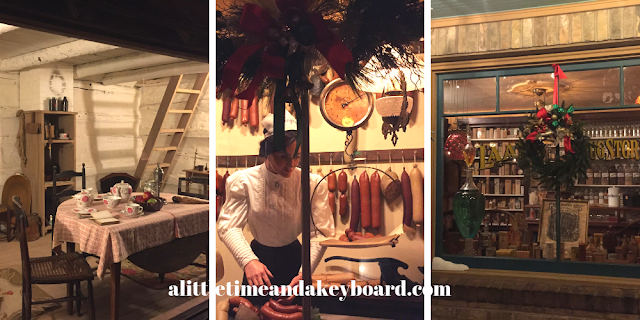 The large scale diorama depicts Milwaukee's streets from the turn of the century. 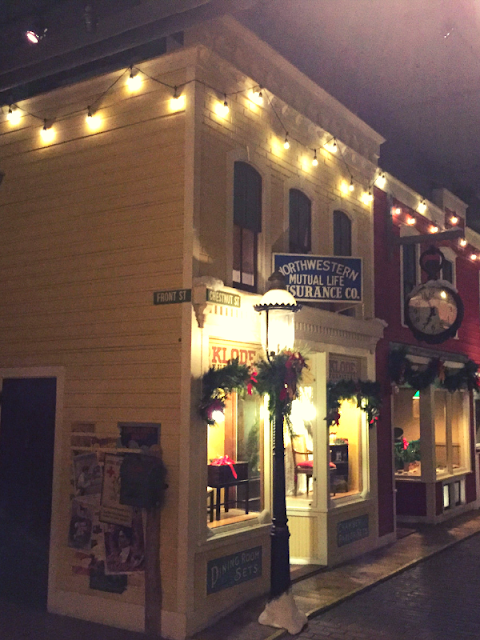 In addition to marveling in street views, you can actually walk inside of some of the buildings and even purchase a peppermint stick at the Haymarket Candy Store. This charming exhibit is over 50 years old! Peeking inside the shops and homes of Old Milwaukee. Check out the turn-of-the-century phone booth! Plus, who can resist riding the old school bike? After, it was time to see some dinosaurs! The first exhibit we examined displayed a Torosaurus. The Torosaurus was not as common as the Triceratops. The Torosaurus had a longer frill among other differences from a Triceratops. Below, the brown sections are the sections of the skeleton that were excavated. Torosaurus skeleton at the Milwaukee Public Museum. The multiroom exhibit included plenty of fossils. At one point, we viewed a diorama showing what the fossilized organisms may have looked like in the ancient seas. 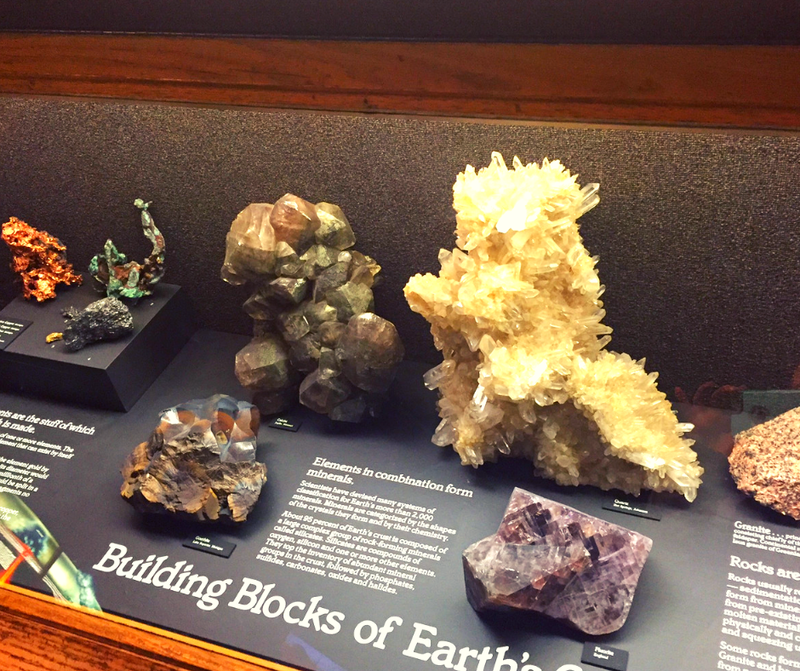 The exhibit also discusses plate tectonics and includes incredible specimens of rocks and minerals helping learn about the Earth's processes. A collection of curious display fossils explaining the changing conditions leading to the rise and proliferation of new organisms and the extinction of others. One of the most celebrated exhibits includes the Hebior Mammoth which was excavated in Kenosha County, Wisconsin. For some reason I did not snap a shot of the Hebior Mammoth but it is in the atrium when you enter, so take a peek. The Hebior Mammoth is particularly significant because 85% of its bones were discovered. The museums does hold the skeleton and has a magnificent cast on display. The museum also has a collection of Ice Age skeletons. Really a neat display! Nearby is a glacier exhibit where you can walk inside. A collection of Ice Age skeletons. If you need a dose of warm weather and natural wonder, the Puelicher Butterfly Wing is for you. Truth be told, the reason I visited the Milwaukee Public Museum on such a cold day was to enjoy some warm heaven with butterflies. However, I quickly fell in love with the whole museum! A collection of exotic and native butterflies will flutter by in the Puelicher Butterfly Wing. The Puelicher Butterfly Wing is home to both native and exotic butterflies. Take time to view the various life stages of the butterfly as well as be surrounded by hundreds of flying beauties on your visit! Throughout the museum, various ecosystems are highlighted on a large scale so families can be enveloped in them. One of these exhibits, the Costa Rican Rainforest, allows visitors to view rainforest specimens at the various levels of the ecosystem including the canopy. You can somewhat get the idea from the photo below. We really found it a treat to wander up and down through the rainforest! Exploring the levels of the rainforest. A Tribute to Survival includes an incredible display depicting a modern powwow. The powwow was assembled with the input of Wisconsin tribes. Area tribes fabricated all of the costumes and the drum used in the exhibit. The significance of each costume is detailed on placards. When you visit, plan to spend some time exploring this exhibit. 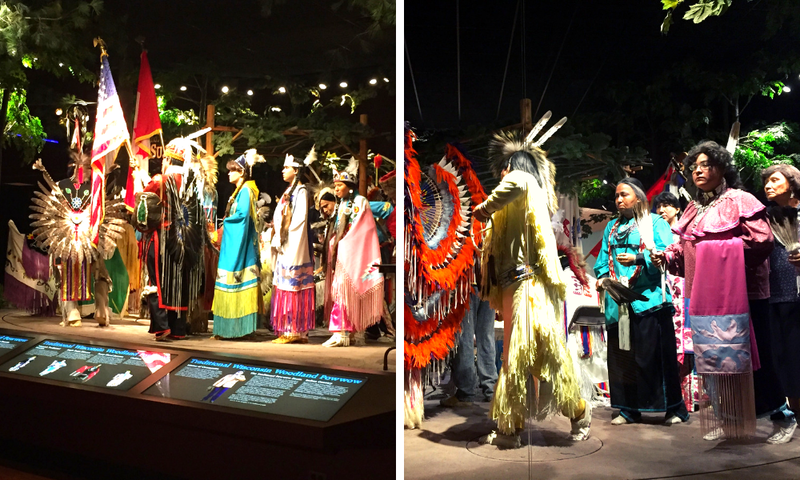 Incredible powwow exhibit created with the input of Wisconsin's tribes. Incredible exhibit of wood artifact carved by Native American tribes of the Pacific Northwest. On the third floor, exhibits present the Arctic, Asia, Africa, the Pacific Islands and more. By the time we reached the third floor, we were approaching time to go. So, we did not go through these exhibits thoroughly and would like to return to spend more time. We were amazed by the depth and breadth of the exhibits at the Milwaukee Public Museum. The range of cultural and natural exhibits will definitely have something everyone will enjoy. In addition to the specimens and artifacts, there are several exhibits dedicated to showing visitors how scientists work. They are very informative and encourage further discovery. The Milwaukee Public Museum is very engaging and the type of resource you will enjoy visiting again and again. Also consider visiting the theater or planetarium. There is a sizable gift shop. The Milwaukee Public Museum is committed to sustainability. The museum is involved in a few different modes of being more sustainable and has a green roof. They are always looking for more ways to become more sustainable. Walking through the streets of Old Milwaukee looks so fun! 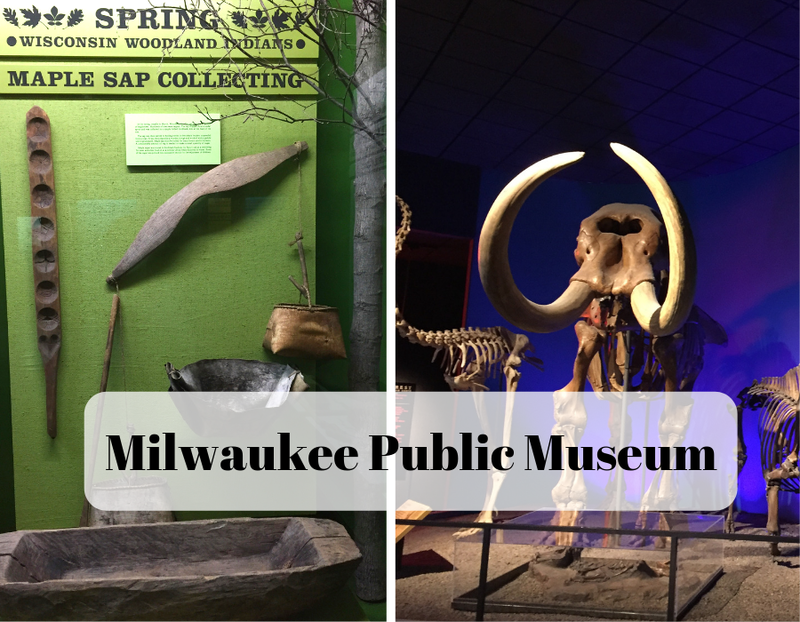 We also love the Milwaukee Public Museum. 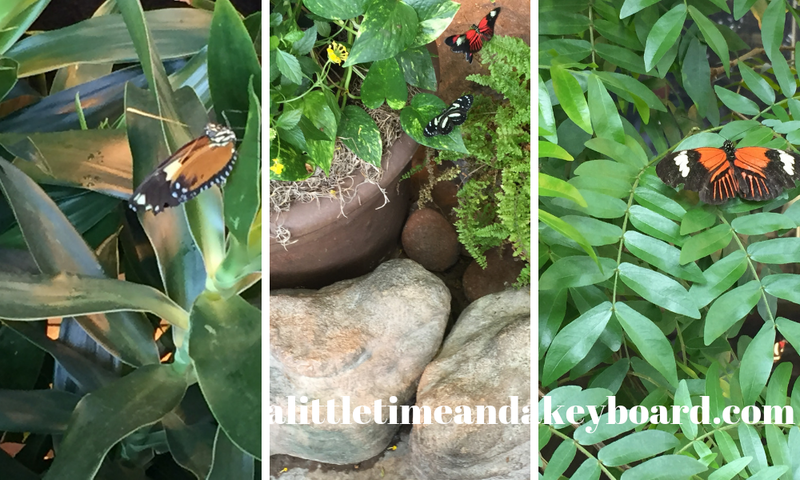 My kids adore the dinosaur area, and my daughter loves the butterfly exhibit too!